Kenyan Prime Minister Raila Odinga has said fresh elections may be needed if the rift in the power-sharing government cannot be solved. He is demanding that he be put in charge of government business in parliament, to replace Vice-President Kalonzo Musyoka. Mr Odinga and President Mwai Kibaki agreed to share power last year to end months of post-election violence. But relations have soured and the two parties have held crisis talks. Over the weekend, President Kibaki's Party of National Unity accused Mr Odinga's Orange Democratic Movement of "fomenting a coup". The president's allies say he has the power to decide who should hold the crucial position of leading government business in the house. The speaker of parliament is due to issue a ruling on Tuesday. 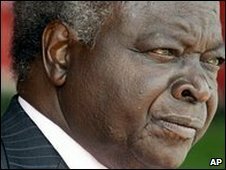 6 April: Odinga labels Kibaki's governing style "primitive"
Does Kenya need new elections? "We have been pushed around enough. We have reached this point and we cannot retreat. We shall stand firm. If others do not want this then let us go back and hold elections." Mr Odinga has previously said he was being sidelined in the government. Earlier this month, his party said it would boycott cabinet meetings, leading to inconclusive crisis talks. Mr Odinga recently complained at a public rally that no red carpet or toilet were provided for him during an official visit. The prime minister has also said that the vice-president should not be getting paid more than him. Mr Musyoka used to be a senior ODM official but split to form his own party - ODM-Kenya - and is now seen as close to the president. About 1,500 people were killed and 300,000 forced from their homes after Mr Odinga's supporters said he had been cheated of victory in the December 2007 presidential election. Former UN Secretary General Kofi Annan managed to broker a power-sharing deal in February 2008, which ended the violence.